A well-constructed slice of retro solidbody. The dual pickups make this extra versatile. No gigbag or lefty option available. 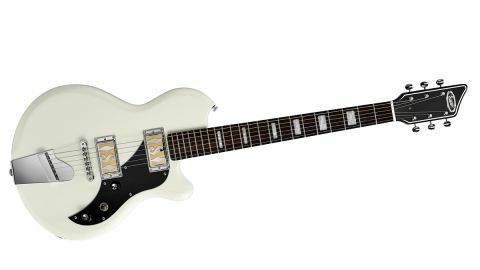 To kick off 2017, then, Supro guitars are back, relaunched in two ranges: the modernised solidbody Island series of three guitars, and the more expansive 10-strong semi-hollow Americana series, modelled directly after probably the most famous, if originally short-lived, of Valco’s designs - the Res-O-Glas models. Today, we’re running the rule over the Westbury. The Indonesian-made Island series is straightforward with three models, all named after Long Island locations that are close to Absara Audio’s HQ in Port Jefferson, New York. They come in various colours and single- (Jamesport), double- (Westbury) and triple-pickup (Hampton) configurations. Their construction is identical, aside from a different pickup switch on the Westbury and the triple- pickup Hampton (three-way toggle and five-way lever respectively), and block fingerboard inlays compared with the dot inlays of the Jamesport. Based on an early 60s Supro Ozark with its well-known and distinctive single-cut outline, the Island models are certainly sharply made, although the opaque colours completely hide the 41mm deep alder slab body with its chamfered edges. The maple neck isn’t bolted to the body - as the wood combination and its Fender scale length would suggest - but is, in fact, glued in. That said, the full width of the neck slots into the body, which has a round-nosed comfortable heel. It’s more like a bolt-on joint, but without the screws. It features a chromed metal plate, secured on the rim only by the base strap button, and two smaller cross-head screws that simply sit above the face of the body. Screwed to that is a slightly offset aluminium anchor block, with nicely rounded edges. This block is sited further back than the standard stud tailpiece that usually accompanies the ubiquitous tune-o-matic bridge. The nut is Corian and nicely shaped, while the vintage-style single tuners certainly look the part and have a smooth enough, positive feel. It’s not rocket science, but it’s good guitar-making. Unlike the Jamesport, the Westbury features dual pickups. These are placed in standard bridge and neck positions and controlled by a three-way toggle that sits between the volume and tone. Both Island series guitars (Jamesport and Westbury) are nicely weighted and are pretty Les Paul-like in size with a very conventional, familiar feel, seated or strapped on. The neck, too, isn’t taking any chances, recalling a more vintage-y clubby feel, but with more mainstream depth. The satin neck back (which appears to simply be the gloss finish cut back with abrasive paper and wire wool) feels super-smooth and will no doubt return to a pretty burnished glossy feel with playing. Another nice touch. A quick unplugged strum reveals a long and quite smooth sustain on the Island series guitars. a bit more spike and bite, while the neck pickup (with a DC reading of 7.9k) restores the low-end but still with that slightly textured clarity. The pickup mix here typically adds some hollowed Tele-like bounce, as you’d expect - a less direct sound than either pickup voiced on its own. It’s a different sound from the benchmarks of the Fender single coil and the Gibson humbucker, although it’s the former that it’s closest to, albeit with less susceptibility to pickup hum. These are pretty quiet, and in the Westbury’s mixed position, quieter still. But it’s presumably the absence of polepieces in the pickups that creates this less direct, more dissipated sound. Where you get that hugely percussive Strat neck pickup sound, for example, the Supro diffuses that punch, but adds a more harmonically complex voice. For chiming trebles - especially in an older school amp setup with tremolo and lashings of reverb - you might well get addicted. It’s a hugely 60s, roots-y, indie voice: way more Chicago blues and far from smooth jazz. It’s a real ‘time travel’ sound - not dissimilar to Supro’s amps and effects - and not only is it a perfect driver for those vintage-style effects on your pedalboard, but if you want to lose the ‘rock’ and access the lo-fi grunge and plenty more, these are perfect tools. The Island series models certainly have a contemporary feel about them and are sharp in fine details.